Wax, glass, paper. 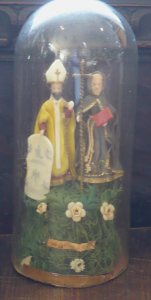 Small wax sculpture (ceroplastic) showing standing St. Cyril and Method in the upper part. At the bottom of the high pedestal simulating a grass surface with white flowers. Original paper label with saints' names. Statuettes are protected by a glass hat (bucket), at the top of the arched. Bohemia 1880 - 1920. Pilgrim souvenir. Certificate of sale and export of the National Heritage Institute. Height 20 cm, width 8.5 cm.